Providing a meeting point on the internet where creators and users can share thoughts and opinions with a large number of participants. The problematic background for starting a weblog was a need to share, mostly funny, information to friends and a larger crowd. The success of these weblogs created a new opportunity for its users. They were now able to reach a large audience with their opinion. Conventional media (e.g. newspapers, television) didn’t offer users a chance to express their opinions and to engage in discussion with others. This is mainly due to financial, technical and censorship reasons. People had no chance to express their opinion and to discuss it with a large audience. A weblog is a website on the internet that regularly adds new information items. The first weblogs started as a simple website to quickly place and store items. Sometimes the creators would add a personal opinion. Nowadays a weblog remains a website to place and store items on. But the improvement is that weblogs have evolved into a window of opportunity to express the opinions of many users. Users can now view, post and comment on items. The items vary from stupid or even offensive pictures and movies to serious and even scientific articles and columns. People can (anonymously) express their opinions, feelings and beliefs too a large audience. Because it makes use of the internet the amount of potential viewers and participants is extremely high. Weblog can already be realized with current technology and can be set up in literally minutes. Since internet access is becoming a commodity, weblogs are growing in numbers fast and only now the conventional media are starting to get aware of them and begin to see their potential. For years weblogs were only known to ‘insiders’. Because the facts that it’s an open source technology that is available to every person with an internet connection, and that weblogs are maintained by large groups of users, many weblogs evolve rapidly. There are weblogs that started only two years ago with a handful of visitors, and who now receive more than 700.000 unique visitors a day. This also causes great development in the technology behind the weblogs. Because of constant user feedback the weblogs keep improving. Starting a weblog costs nothing. 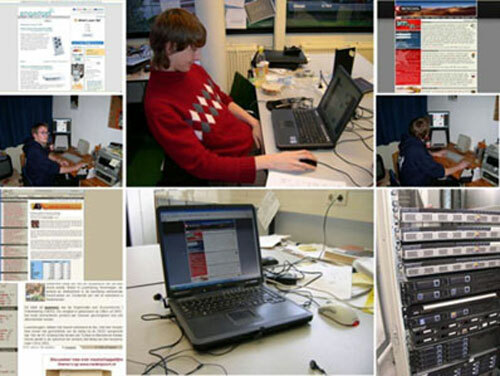 When the user wants his own domain he needs web hosting which costs about €5 a month. Hosting costs increase when the weblog contains more information and when it attracts more users (more users who download/view the site generates more data traffic which has to be paid by the owner. Most weblogs rely on the work of volunteers. Weblogs have quite an impact on society. High numbers of people have the chance to be heard. To be heard by a large audience that consists out of various people in society. And there is a great room for discussion, which can result into better informed, or at least more into depth, information gathering. Society can benefit from this because people can start discussions on the internet about things that bother them, they can be heard in stead of always listen. Weblogs are aware of their attractiveness and impact that they can generate. And this position can be used to make people aware. For instance Dutch weblogs have started quite large campaigns to raise money for the Tsunami-disaster in Azie, all on their own specific way. Also the weblog retecool.com has lend its strengths to a popular radio station, to raise awareness and cash for the situations in Darfur. Concluding, weblogs have the power to create awareness. Weblogs are cheap and very effective. Its marketing use is already known and powerful. They also start their own merchandise shops. In the near future weblogs might also become commercially self-supportive.